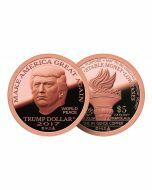 Please note: 2017 Gold MAGA products are minted on-demand, and as such have a 30-day delivery time. 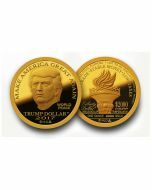 The Proof Gold MAGA Trump Dollar features the iconic portrait of President Trump with the MAKE AMERICA GREAT AGAIN legend on the obverse that is carefully struck four times with a stunning ultra high relief (URH) obverse die to produce flawless specimens. 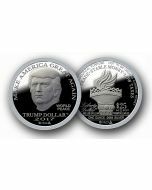 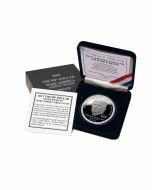 The reverse features the legend: FREE TRADE – STABLE MONEY – LOW TAXES as the winning combination to Make America Great Again. 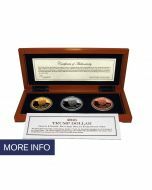 The Proof Gold MAGA Trump Dollar is packaged in a tamper-proof capsule and an engraved wood case with a Certificate of Authenticity plus an outer box for a maximum Presidential presentation and protection. 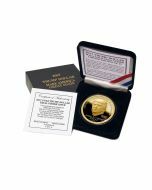 The Proof Gold MAGA Trump Dollar measures 32mm and contains one Troy ounce of .9999 fine gold.